URBANDALE, Iowa — In an exclusive interview with Breitbart News, former Hewlett-Packard CEO and likely GOP presidential candidate Carly Fiorina says America is at a “pivotal point,” and it’s “hugely important” a Republican is elected president in 2016. “I think what’s at stake is the state of the world, which is a very dangerous and tragic place when we’re not leading,” Fiorina said, referencing President Obama’s foreign policy of leading from behind. She said Americans need to stand together to get the federal government under control. In an event in Urbandale, Iowa – right outside of Des Moines – Fiorina met with a room full of voters in the Westside Conservative Club. She told them to help her when she gets out there in a few short weeks—hinting at her anticipated announcement coming May 4. “I think it’s fair to say that an announcement is coming soon – and that we are going to endeavor to announce in a way that as many people as possible can participate in it,” Fiorina told Breitbart News. Being the only Republican woman at this time mulling a run for the presidency, Fiorina has a strong case to make that she’s the best suited to go after Democratic candidate Hillary Rodham Clinton. A piece in The Daily Beast on Wednesday drew that distinction, laying out how Fiorina can take away Clinton’s crutches: Identity politics. Here in Urbandale, she hammered that point home. Clinton, she said, wants to talk about everything but her lack of accomplishment. Speaking to the crowd, Fiorina discussed leadership—and how elitist CEOs like Bill Gates and Steve Jobs aren’t where that’s found. “Leadership is about unlocking potential in others,” she said, adding that Gates and Jobs aren’t heroes. Rather, she said, it’s small businesses in the everyday communities across America that are the real, true heroes because they’re the ones that create two-thirds of the jobs in America’s economy. “Everywhere I have gone, I have figured out everybody has God given gifts,” she said, adding that human potential is the only unlimited resource America has as a country. One man in the crowd asked Fiorina how she plans to reignite the spark of patriotism in the American people. “Our founders wrote the Constitution because they understood well the abuse of power,” she replied, noting the founders intended to restrain the power of government – not the potential of an individual. “Spirit of self government can be reignited in American people, but it will take leadership,” Fiorina said. She went on to say she has met more world leaders than all Republican presidential contenders in the race thus far, with the exception of Hillary Clinton – the likely Democratic presidential nominee. But, Fiorina quickly added, unlike Clinton, she wasn’t taking photo ops. Fiorina said the way Clinton handled Benghazi by peddling fiction for four weeks sent the message to America’s enemies that they don’t need to worry about the United States being a superpower. She said, having met Russian President Vladimir Putin, that it would take more than a red reset button to restrain his starvation for power, poking fun at Clinton’s attempt at diplomacy with Russia in 2009. Fiorina is spending five days in Iowa visiting several cities and attending town halls to speak with voters in this swing state. 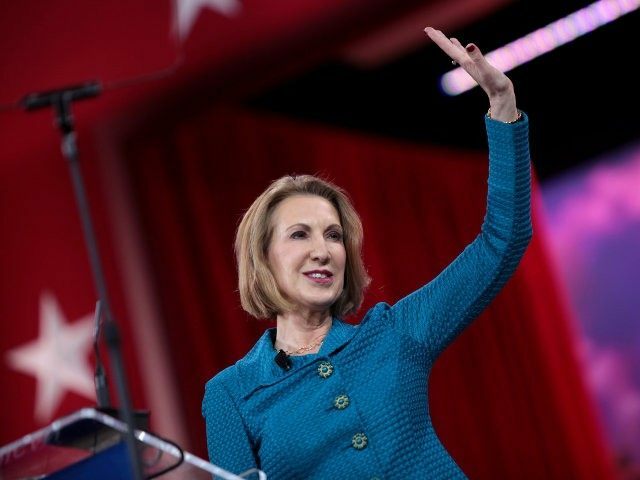 Fiorina will speak at the Iowa Women Lead Change convention Wednesday afternoon in Cedar Rapids.